Want to feed hedgehogs but not your neighbourhood cats? A hedgehog feeding station may well be the answer. It also helps to keep the food and the hedgehog dry when it is raining. Hedgehogs aren’t keen on rain! There are lots of options for feeding stations. You can buy a ready made one – I use a wooden hedgehog house or you can also build your own very cheaply from a plastic box. Please remember that a feeding station should only be used for food – don’t mix dinner with bed and breakfast. Use a separate hedgehog box to provide a house. Decide whether you want to have the box with the lid on or whether you want to turn the box upside down with the lid underneath. Carefully cut out a hole around 4.5″ square. Check the box daily and change the newspaper when it gets dirty. Wash the food bowls regularly to keep them clean. Hygiene is very important to prevent spreading bacteria, as it is with all wildlife and bird feeding stations. If you want to check that your visitor is, in fact, a hedgehog, the best way is to invest in a night camera. You can place a non-toxic ink pad at the entrance followed by a white paper lining. You should then be able to spot hedgehog footprints made by the ink…. If you haven’t spotted a hedgehog before but want to know if they are in your area, you can also check out the Big Hedgehog Map. Another tell-tale sign of a hedgehog visiting your feeding station is what is left behind. A hedgehog will leave some crumbs like in the picture above, whereas a cat will wipe the bowl clean. A hedgehog may also leave you a calling card in the bowl or nearby. For this reason it is also vital to keep your feeding station clean. I change the newspaper lining daily – to avoid any parasites or bacteria passing between hedgehogs. I also move the feeding stations around regularly to new locations. I site the feeding stations in open areas where I can monitor them with my night cameras and easily access them to top up the food and water. I keep them separate from hibernation boses. For suggestions of what food to put in your feeding station please read my blog. I run a hedgehog rescue in York. My work is entirely self-funded. If you have found this information useful you can read more about me here and also how to support my work. 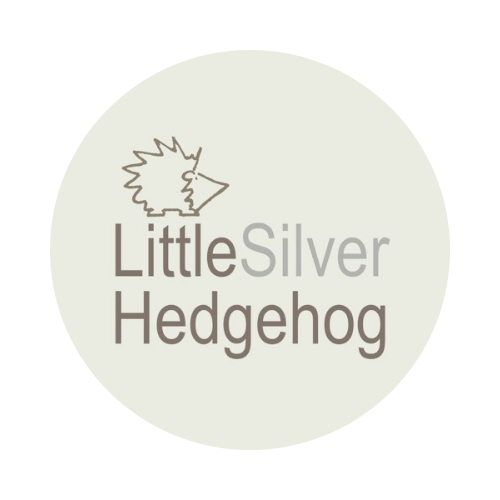 I also make silver jewellery inspired by nature and wildlife to raise funds for my hedgehog rescue work. Please check out my online jewellery shop here. This is a great idea and I love your suggestion for checking paw prints with ink, my wild child would love to do this. Thanks so much for this hedgehog feeding station instructions! I can’t wait to make one for the hedgehog that comes into our garden! Just fantastic!! Thanks for this great blog post! LSH you are a marvel in every way and I have been reading your blog voraciously since discovering it – but am I right in thinking the top photo shows 3 hogs eating mealworms? Elsewhere you’ve talked about the advice NOT to feed mealworms due to risks of metabolic bone disease? Or maybe it’s my tired eyes on a Friday night playing tricks on me, in which case sorry! Hi, you talk about neighbors cat, but you forgot the rats. I feed hedgehogs for a couple of years. All of a sudden, there was no food in the mornings left. My neighbor showed me a couple of days later Fotos of a ratfamily. Since this time I don’t feed anymore. I feel sorry for the hedgehogs, but I don’t like rats in my garden. Hello, unfortunately there is no way to stop rats but I generally don’t find that hedgehog food causes a rat problem. It is more likely something else that causes the problem. Rats are everywhere so seeing the occasional one is normal but, if you are seeing lots, and in daylight then there is a rat problem that needs investigating. I have fed hedgehogs for a decade and only ever seen the occasional rat…..